The accordion player Chango Spasiuk has transformed Chamamé - a marginalised rural dance music - into an elaborated new form (or so it says in the Press Release). Spasiuk was born in 1968 in Misiones, a small province near the Brazilian border in the northeast of Argentina. Its society is the product of a complex process of fusion and interaction between the disparate elements of its population: the original native communities - the Mbyá-guaraní - the Creoles, and the foreign settlements established at the beginning of the 20th century, like Chango's two Ukrainian grandparents. His formative years were spent in a highly stimulating milieu centred on the carpenter's shop managed by Lucas, his violinist father, and Marcos, a singing uncle. The singing duos in red-earth patios set aside for musical events, the unrelenting subtropical climate, a terrain of jungle and wide rivers, of labourers working with hoes and machetes on the yerba mate plantations - this is the world that underlies the powerful texture of his music, where one can find the regional styles and rhythms of schotis, rural polkas, rancheras and rasguidos dobles. Since learning the accordion at the age of 11, he started playing in local dances; and after a presentation in the main folk festival of Argentina, he started to tour all over the country, and then abroad - Germany, the Netherlands, France, Spain and Great Britain. His music went through changes throughout the years, but it has always kept the essence of where he came from: the red lands of the northeast of Argentina. Indeed, like many of us, periods of experiment with new forms has actually led him back to where he started, and he and his band are now completely acoustic. 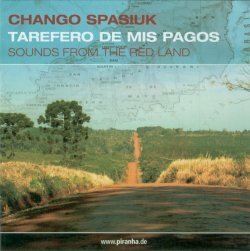 Tarefero de mis Pagos is a delight from start to finish - something of a surprise to me, since I noticed that only one of the tunes was traditional! Most, though not all, of the others were composed by Spasiuk himself. The tunes range from fast, red-hot dance music, where his technical skills are well displayed (as are those of his guitarist, Marcos Núñez) to some far slower, reflective pieces, and quite and number of songs. One of Chango's great strengths, it seems to me, is his willingness to use aural dynamics in his playing - occasionally the volume level drops so low that it's difficult to be sure whether he's still actually playing. Thus, you're constantly being required to pay attention to what's going on - not at all usual with a CD of dance music! I don't think I can leave you without a couple of sound clips - just a taste of an hour's worth of excellent music. Track 1, El Prostíbulo is on the left, while track 11, Mi Bien Amada is on the right.